The other night, the Mothers of the Movement who comprise the mothers of so many Black folks who have become unfortunate hashtags in recent years (e.g. Trayvon Martin, Tamir Rice, Sandra Bland, etc.) spoke at the Democratic National Convention. (I highly encourage you to read Melissa Harris Perry’s amazing write up on it.) When I see these heroic women, I think about all the Black mothers and fathers in our country who bear the incomprehensible burden of preparing their children to venture out into an often violent and unwelcoming world. I grew up light-skinned and middle-class, and thus know very little about navigating urban war zones or suburban cul-de-sacs while Black. Nonetheless, my 20 years as an educator have made it clear to me that our streets are not the only minefields Black youth face. Our schools are merely a reflection of the societies which create them. Just as police officers and politicians justify physical brutality against Black and Brown folks in the name of “law and order”, I have witnessed educators perpetrating social and emotional violence under the guise of “discipline”. Support or punishment? That depends on your skin color. …Whiteness protects itself and comes out in these nefarious ways in multiple systems in the United States. It rips my heart out to know that Lashawn’s mother trusted the system that much. She trusted us to have his best interest at heart and she trusted us to know the care he required. Calling the police for him was wrong, it was a mistake, and it was racist. I know why she trusted us. Parents of Black students are often told that their children require more discipline and that schools need to step in to help them. It’s the way the system works and it disempowers parents raising Black children by taking control of parenting them en loco parentis. 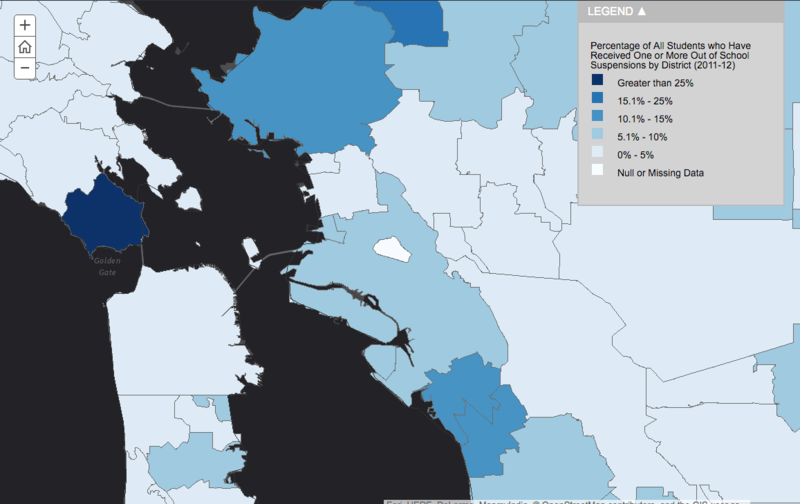 San Francisco is doing a great deal to improve how it handles discipline. I’m not sure how the data has been collected, nonetheless, you can see that we are doing much better as compared to other districts. That said, there is a lot of hidden data that we don’t collect. How many students receive detentions? “in school suspension”? (where students are suspended from class and placed in another classroom in the school to do busy or make-up work) or are sent to another teacher’s classroom temporarily? How many kids are “benched” during recess or PE? How is this data tracked by race, gender, and program, etc.? Much of what we know is that white students are kicked out of the classroom for things we can see: throwing, hitting, tantrums. Yet, Black students (and many SOC) are kicked out for unseen things: having an attitude, insubordination, and the ambiguous "disrespect". There's an enormous difference between DEMANDING respect and COMMANDING it. Teachers should be the models for commanding it. And about Black children who are autistic and on the spectrum. It's not just dangerous out here in these streets: classrooms count, too. From EdSource: The percentage of all suspensions that were for willful defiance dropped from 48 percent in 2011-12 to 43 percent in 2012-13. As Kelly points out, institutionalized racism plays a big part in the ways students receive discipline. 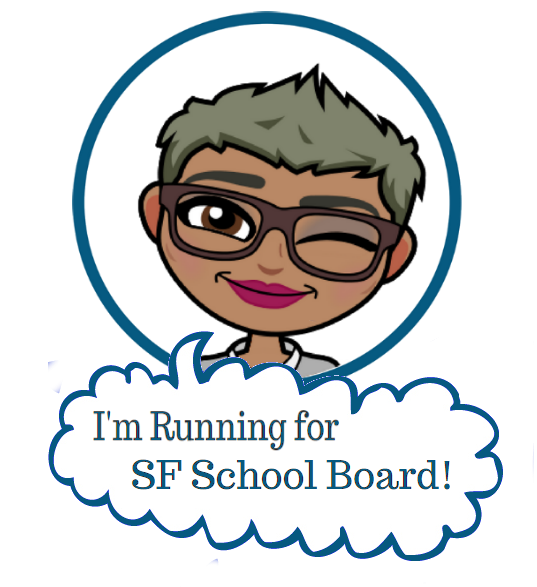 Several years ago SFUSD, discovered Black children were being suspended for “willful defiance” at much higher rates than other ethnicities. 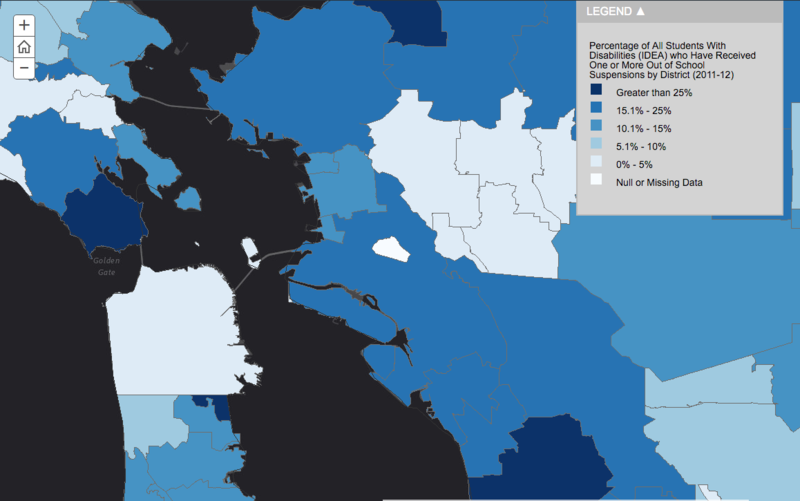 Data showed that in San Francisco, Black students made up roughly 10 percent of the student population yet accounted for more than half of suspensions and expulsions. Latino students also were suspended at higher than average rates. In response, the district eliminated this category and suspension rates dropped dramatically. In addition to eliminating suspension categories like “willful defiance” schools must address teacher empathy for Black children, and especially those in need of special education services. Going back to the data from the National Center for Educational Statistics (NCES), we can compare suspension rates by district for students receiving special education services. 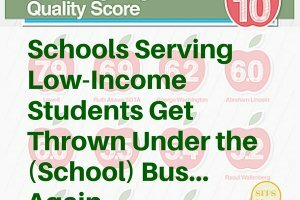 Students with disabilities were more than twice as likely to receive an OSS as students without disabilities during the 2011-2012 school year. It’s not just “bad” kids getting kicked out of class. How we handle discipline has a lot to do with how we perceive our students as challenging vs. defiant (read: our own internalized racism, otherwise known as implicit bias). 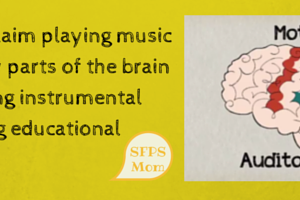 It often has something to do with our capacity to work with kids with various learning needs. It also has a lot to do with our ideas about discipline/punishment and our role as educators and parents in helping kids learn pro-social skills or get the support they need to be successful. Middle schools who participated in the study showed a reduction in suspensions by half. (!) The intervention also helped previously suspended students feel “more connected at school”. Kids know when they are wanted. They also know when you have high or low expectations of them. In another example, I joined a friend’s parent-counselor meeting only to learn her middle school daughter was consistently late/absent to classes on days she was AT SCHOOL. I had to wonder… what are staff expectations when kids roam the halls? What are expectations for teachers, security aides, paras, and office staff in getting kids in class. I wonder what the racial and gender demographics are on these “soft” tardies and absences. Why do kids “opt out” of class? They may be doing what teenagers do… pushing boundaries. Instruction could boring or culturally irrelevant (like reading only books by “dead White guys”). Or, maybe students are picking up on the fact their teachers don’t really want them in class. Sometimes, as was the case in Kelly’s story, students are in crisis and cut class to get support from friends. Nonetheless, we will never know why kids are out of class IF WE DON’T EVEN TALK TO THEM!!! Parents and educators: Let’s push back on institutionalized racism in our schools! In order for Black lives to matter on our streets, Black minds must matter in our schools. 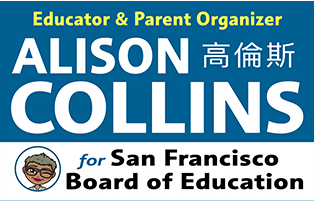 Join parent leadership groups (If SFUSD, your School Site Council) this fall and ask questions about school discipline and attendance. Ask to see school data broken down by race, gender, language, program, and specifically look at students receiving Special Education services. Middle and High School – Ask about “in-school” suspensions and detentions. Ask about who is late and absent by period as well. Get involved in your school and district AAPAC (African-American Parent Advisory Council) or other affinity groups. (Latinx families, join your La Raza club and/or English Language Learner Advisory). If your school doesn’t have one, start or support one. Ask families what their and their childrens’ experiences are with discipline and student attendance at your school. Learn about Restorative Practices at your school. Have all teachers been trained? How are Restorative Practices implemented in your child’s classroom? How are parents informed? Are staff receiving professional development around “cultural competency”? How is the school addressing implicit (and overt) bias among staff? How are White and Asian developing racial empathy for underserved youth and families? Parents and educators MUST step up. We mush push back on institutional racism in our schools to ensure all kids get access to a great pubic school education. It’s up to all of us to speak up, ask questions, create change. Let’s roll up our sleeves and get to work! What do you think? How can parents and educators improve disparities in attendance and discipline in schools? What are other ways you see institutional racism in schools? 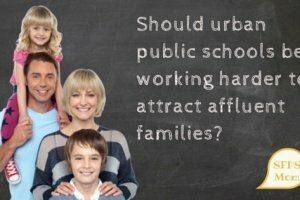 This post by a fellow SFUSD parent has generated quite a bit of constructive dialogue about the "value" of affluent families in public school.